Scarlets coach Wayne Pivac says full-back Leigh Halfpenny is offering a great option for the Wales management after two games back. Halfpenny has played 80 minutes in both Scarlets wins since his comeback, after three months out with concussion. He will now rejoin the Wales squad preparing to face Scotland. "Isn't it great to have players performing at Test level and then a guy like Leigh coming back from injury and playing the way is," said Pivac. "It's just great for those selectors but it's a tough one (selection call) isn't it, I'll leave it to Warren Gatland." But the form of Liam Williams, who was man-of-the-match against England, Josh Adams, who scored the crucial try and George North could make it difficult for Gatland to change his starting team at Murrayfield. Halfpenny helped create the only try of the Scarlets' 10-6 win over Munster in driving rain, as well as making a vital covering touchdown in defence late in the game and kicking his only two shots at goal. 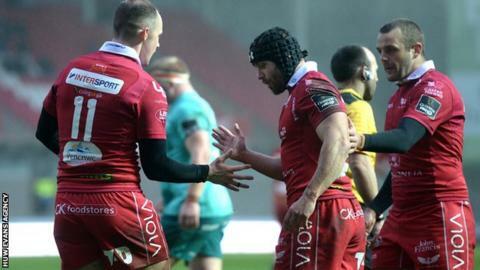 "I thought he was great last week in the dry (against Cheetahs) and great in the wet, he had a very good game," Wales coach-elect Pivac told BBC Sport Wales. "He's doing everything asked of him at the moment, it's great for Leigh and for the Welsh management." The Scarlets have moved ahead of Edinburgh in a congested conference table, with four sides contesting two Pro14 play-off spots behind Leinster, as well as a potential European Champions Cup play-off spot for the fourth-placed side. The Scarlets are now well placed to continue their challenge for Pro14 honours when their front-line Wales players return, away to Cardiff Blues on Friday, 22 March. "We're a couple of points ahead of where we thought we'd be," admitted Pivac who will succeed Gatland after the World Cup. "We're very much in the race and if we play with that commitment we'll be fine," he added. "We've got Blues away which is a big derby for us, then Edinburgh who're fighting a place in the top three, and we'll worry about the rest (Zebre and Dragons) after that."